On Saturday I was at the ADAC Rallye Deutschland, the 9th round of the FIA World Rally Championship 2013. I was at SS11, the Arena Panzerplatte stage, were Jari Matti Latvala nearly retired after hitting a ”Hinkelstein”. It was fantastic, until the rain came, which then was the reason of the cancellation of the historic event, what is always great to watch. It was also a great stage for Sordo, because he overtook Neuville in the overall classifications for the lead of the rallye, and he stayed there. Then the last stage of the rallye ”Dronthal 2” what was also the Power Stage. Sordo was only 25 km away from his first WRC win. He started the stage behind Neuville, who was only 3 seconds behind Sordo in the overall standings. Now both started the stage. Sordo was faster in the first split time, but in the second he was only 0.1 seconds faster than Neuville. In the third split time they had the exact same time, it couldn’t get any more exciting. But suddenly Neuville made a mistake and lost nearly 30 seconds. After that it was clear that Sordo had won the rallye. Dani Sordo came into the JWRC (Junior World Rally Championship) in 2005 driving for Kronos Racing in a Citroen C2 S1600. As teammate he had the brit Kris Meeke. He won 4 rallyes, including a home victory at Spain and won the JWRC championship afterwards. Sordo then began his WRC career back in 2006, again driving for Kronos in a Citroen Xsara WRC. He’s teammates were, at that time 2-time WRC champion Sebastian Loeb and Xavier Pons. Sordo was 8th at the season opener, the Monte Carlo Rallye. He was only 16th in Sweden, but in Mexico he got an impressive 4th position and then got two podium places at Corsica and Spain. He was then promoted as a No.2 driver at Kronos, because Pons was more crashing than making results. Sordo scored a 2nd place finish at Germany and was fourth at New Zealand as a replacement for the injured Loeb. Then Citroen came back to the WRC in 2007 with the new C4 WRC. After a great 06 season, Sordo joined the factory Citroen Racing WRT together with triple world champion Loeb. From 2007-2009 he got many podiums at tarmac rallyes, but never a win, because his teammate was also the guy to win these rallyes and he was the clear No.2 driver so he had to help Loeb to secure the titles for him. He even had to let Loeb pass for the lead at Spain 2008, what was quite hard for him. In 2010 Sordo did the same thing like in last three years, but Citroen wanted more from him, they wanted him to be more succesfull on gravel rallyes, even wins there. But it never happend, so he’s Citroen seat looked really bad, because there was one young french driver who was to replace him, a guy called Sebastian Ogier. Ogier drove for the Citroen Junior Rallye team, nearly winning at New Zealand and then winning actually at Portugal, he showed winning potential on gravel and tarmac. So he replaced Sordo for the gravel rallyes at the 2nd half of the WRC 2010 season. Sordo only drove for the factory teams at the tarmac rallyes and driving for the Junior team at the gravel rallyes. Well after Ogier won at Japan, it was clear that he will replace Sordo for the 2011 season, and it happend. Sordo then switched to Mini for the 2011 WRC season, his teammate again Kris Meeke. After a lot of testing the John Cooper Works WRC car (based on the Countryman) it made it’s debut at the Sardegna Rallye, were he ended up being 6th. Then a disappointing Finland rallye, but a great Germany rallye with finishing 3rd overall. Another two podiums at France and Spain later in the year. So it looked quite promising for Sordo and Mini, as they will compete the full 2012 season. But after a great 3rd position at Monte Carlo, everything came to the opposite direction. BMW pulled out the financial support, so Prodrive didn’t had enough money to compete the 2nd half of the season, the actually long term Mini project was over. Sordo then became a 2nd chance at Citroen, after Ogier left the team in 2012 and Loeb slowly retiring from the sport. A terrible to the 1st half of 2013 for Sordo, lacking pace behind teammate Hirvonen. Citroen again wanted to replace Sordo for the rest of the ”gravel” season with Kris Meeke. But now after the win in Germany, it’s unlikley that they won’t keep him till next year (at least). Sordo competed in 106 WRC rallyes until winning his first event last weekend. He truly deserved it, now i hope this won’t be the only one…. Note: This rallye was overshadowed by the death of two dutch rallye drivers (one driver, one co-driver) who died at Saturday evening at ”Panzerplatte 2” in a Triumph for the Historic event. They had crash at the ”Gina” jump. Thoughts are with thier friends and family. Sebastian Vettel dominated the Japanese Grand Prix from start to finish as he closed down the gap to Alonso in the drivers championship to mere 4 points as the latter retired from the race on the very first lap. On the very first turn, Alonso and Raikkonen made contact as the former ran off the track and spun into retirement. That wasn’t all as Grosjean ran into Mark Webber’s Red Bull on the very next turn and Senna putting Rosberg out of the race. Alonso along with Rosberg retired from the race while the rest continued. This brought out the Safety Car as the action stopped for next few laps. A few laps later Stewards handed a stop-go penalty to Grosjean and a drive-through to Senna. The action resumed on lap, with Vettel leading the race from Kobayshi, Button and Massa. Raikkonen was running in 5th place ahead of Segio Perez, Lewis Hamilton and Nico Hulkenberg. Many of these drivers benefited from the first lap accident. The first round of pit stop started on lap 13 with multiple drivers including Button and Raikkonen making their stops. Race leader Sebastian Vettel increased his lead and only made his stop on lap 17. While Kobayashi and Button lost his time behind traffic, Massa made a late stop to jump both of them as he moved into 2nd place. On lap 19, Perez ran wide and out of the race after a unsuccessful move to regain his place over Hamilton. Before the race, it was expected that some drivers will go for a two stop strategy while some will opt for one requiring three stops. However, as the race unfolded, two stops became the default strategy with drivers making their second and final stop from lap 30. Raikkonen was the first to make his pitstop on lap 30 followed by Hamilton on lap 31. Massa and Vettel made their stops on lap 36 and 37 respectively. Hamilton banged wheels on first few turns of lap 31 and overtook the Finn thanks to a quick 2.5 second stop by McLaren. Meanwhile, Vettel continued to increase the lead to Massa and rest of the field as he went on to win the race by a comfortable margin of 20 seconds. This is Vettel’s third victory at Suzuka in last four race and third victory of the season. Massa went on to finish in a excellent second place, his first podium since Korea 2010. A late charge by Button couldn’t prevent home hero Kobayashi from finishing on the podium as Japanese crowd gave a standing ovation to the Sauber driver. Hamilton finished in 5th place ahead of Kimi Raikkonen and Nico Hulkenberg. The latter made into the top 10 on the very first lap making the most of the first lap drama. Pastor Maldonado scored his first points since his victory at Spain with a 8th place finish. Mark Webber switched to hard tyres on the very first lap following the accident and then made only a single stop to finish in 9th place ahead of Toro Rosso’s Daniel Ricciardo. Schumacher made his way to 11th after starting the race from a lowly 21st place thanks to a 10 place grid penalty he incurred at the Singapore Grand Prix. Paul di Resta could finish only in 12th place ahead of Toro Rosso of Jean Eric Vergne. Alonso’s first lap retirement has made the championship wide open with Vettel(190) now just four points behind the Spaniard(194). Raikkonen and Hamilton are 3rd and 4th in the standings with 157 and 152 points respectively. It was a marathon Grand Prix, but at the end of fifty-nine laps of the Marina Bay Street Circuit, it was reigning world champion Sebastian Vettel who was the first driver to meet the chequered flag. In a season of twists and turns, it now appears to be a case of which of Vettel or Fernando Alonso will be the one to claim a third title as twenty-nine points separates the duo, with the circus heading to a series of circuits on which Vettel excels. Having dominated practice and Q2, it came as a surprise to see Lewis Hamilton and Vettel split at the front of the grid by the Williams of Pastor Maldonado. The Venezuelan driver has been known for pulling a fast lap out of the bag when it mattered and so it proved in the dying stages of qualifying. Hamilton set two laps good enough for pole position, with the latter of his attempts the slowest as it included a tap of the wall on the exit of Turn 21. The advantage Maldonado secured through his qualifying lap was soon gone. Hamilton scampered away at the start but the Williams driver ran slightly wide in Turn 2, enough to give Vettel the space to get through, and allow Jenson Button to nab Maldonado on the run down to Turn 5. Mark Webber and Nico Rosberg ignored Turn 2, but the stewards deemed that they had no option but to take to the run-off. A minor collision left Vitaly Petrov with a broken front wing and Felipe Massa with a puncture, dropping both firmly to the back of the pack. Hamilton and Vettel soon pulled a gap on third placed Button, although the 2009 world champion stabilised the gap at six seconds. Vettel’s tyres began to wear earlier than his McLaren rivals, causing the Red Bull driver to run wide at the Singapore Sling and slowly drop back into the clutches of Button. Vettel was forced to pit before Button caught him, and while he emerged from his stop in traffic, he soon found clean air in which to bang in a fast lap. McLaren responded by bringing Hamilton in for his stop, leaving Button out front. After another few laps, he made his stop and emerged around three seconds shy of Vettel. The race appeared destined to be a straight fight between Hamilton and Vettel, although the McLaren man later said that he was cruising when disaster struck on Lap 22. Vettel said his rival had been losing oil for a couple of laps and when Hamilton accelerated after Turn 1, smoke poured from his car. He lost gears, coasted to a halt at Turn 5 and dejectedly walked away to contemplate a third retirement in five races, one that leaves his title hopes in tatters. 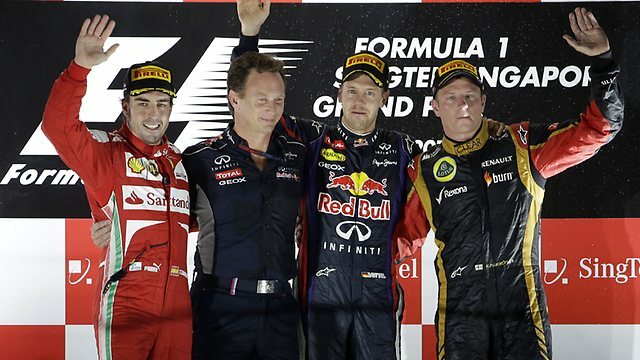 Vettel picked up the race lead ahead of Button, leaving Maldonado to fight with Alonso for the final podium place. When Narain Karthikeyan crashed underneath the grandstand at Turn 18 on Lap 30, the front runners deemed the timing of the safety car ideal to make a second and final stop. The race order remained largely unchanged, although the timing of the caution period seriously hindered Mark Webber’s progress. At the restart Vettel maintained his lead, but further back more chaos prompted a second safety car period. Jean Eric Vergne was battling with Sergio Perez when he was struck from behind by Michael Schumacher, sending both drivers out of the race amidst a spraying of debris at Turn 14. Schumacher arrived at the corner with both front tyres locking and was later deemed to be at fault for the collision. It was the second successive Singapore race in which the German had misjudged the braking zone of his rivals and the second time this season, after the Spanish Grand Prix, in which he had eliminated a competitor in similar fashion. He was subsequently handed a ten place grid penalty for the Japanese Grand Prix. Williams had curiously pitted Maldonado during the second safety car period, dropping him to tenth place and seemingly handing a podium to Alonso. But Maldonado was soon informed that his FW34 had developed a hydraulics issue and he was forced to retire. It has now been nine races since Maldonado won the Spanish Grand Prix; the event remains the most recent time that he has scored a point. With the clock ticking down towards the two hour mark, the race became a timed event rather than running to the scheduled sixty-one laps. Button and Vettel nearly came together at Turn 16 prior to the restart, with the stewards later analysing the data from Vettel’s RB8 to establish that the German had not behaved erratically. The race largely settled down with Vettel maintaining a gap to Button, with a distance back to Alonso and Paul di Resta. The Force India driver had qualified on the third row of the grid and stayed out of trouble to profit from Maldonado and Hamilton falling by the wayside. Nico Rosberg soon fell back from di Resta and just managed to keep the Lotus duo of Kimi Raikkonen and Romain Grosjean at bay. Raikkonen expressed his frustration at a “boring race” with limited overtaking opportunities, although he was let through by Grosjean under instruction by the team. Felipe Massa spent the final stint of the race on the option tyres and he put them to good use. The Ferrari driver passed a couple of his rivals and then pulled off one of the moves of the season. Massa got a run on Bruno Senna exiting the Anderson Bridge, but his compatriot failed to see him in his mirrors, squeezing Massa between the barrier and the side of the FW34. Massa’s car snapped sideways, before Massa saved the car in a Scandinavian flick style manoeuvre. Not only did Massa somehow avoid contact with either the inside or outside barriers and Senna’s car, but he passed his rival in the process. Daniel Ricciardo benefited from his team-mate’s demise to secure ninth, ahead of fellow Australian Mark Webber. However, the latter was subsequently given a time penalty for exceeding track limits when passing Kamui Kobayashi. It was a harsh penalty and once again raises the question of sanctions from the stewards and where the difference is between giving your rival space and passing off of the track. Webber’s penalty elevated Sergio Perez to tenth place, allowing the Swiss team to salvage a point from what was a difficult weekend. Kamui Kobayashi and Nico Hulkenberg made contact, forcing both into the pits for repairs. The collision between Kobayashi and Hulkenberg, combined with the late retirement of Bruno Senna, allowed Timo Glock into twelfth place. The German driver hit the wall early on in the race but continued and managed his tyres on a lengthy stint to record Marussia’s best ever race finish. The result allows the team to leapfrog Caterham in the battle for tenth place in the Constructors Championship. Back at the front, Vettel is now in prime position to become only the third man to secure three successive world championships. Of course, he has a twenty-nine point deficit to recover, but his initial reaction after winning his first race since Bahrain, after the natural elation, was to think of more important matters than mere championship points. “I would like to dedicate it to one very, very special man, Professor Sid Watkins who passed away and we remember him for sure”, he said. We can all agree with that. Singapore: Red Bull driver Sebastian Vettel positioned himself as the main challenger to Fernando Alonso’s Formula One title chances by earning his second straight Singapore Grand Prix win on Sunday, jumping up to second place in the drivers’ championship. Vettel inherited the lead from pole-sitter Lewis Hamilton of McLaren, who led the race until he suffered a gearbox failure on lap 23 of 59 and had to retire. It was defending champion Vettel’s second win of the season after Bahrain and he reinvigorated his chances of earning a third straight title. “We benefited a little bit from Lewis’ failure,” Vettel said. “We had a very, very strong pace all weekend and a good start, which got us in the hunt. “I am just incredibly happy and proud.” Vettel had to defend his win both on the track and in the stewards’ room after the race, having been called in to explain an incident behind the safety car when he hit the brakes unexpectedly at the exit of a corner, forcing second-place driver Jenson Button of McLaren to quickly swerve, with a collision narrowly avoided. Stewards cleared him of wrongdoing. Hamilton suffered his third non-finish in five races ” interspersed with two wins ” as his gearbox finally gave up, having leaked fluid for three to four laps before he retired. “It’s heartbreaking not to have finished the race today,” Hamilton said. “We definitely had the pace to win this weekend. In fact, before I retired, I was cruising.” Button was right on the tail of Vettel when racing resumed after the safety car with 18 laps to go, but said his car felt unbalanced in the closing stages, and he was not able to challenge the German. The race was stopped when it reached the two-hour time limit, two laps before its scheduled finish, chiefly due to two safety car periods. Alonso finished third in his Ferrari, with his championship lead trimmed from 37 to 29 points with six races to go, giving Vettel fresh impetus as he seeks to join Juan-Manuel Fangio and Michael Schumacher as the only men to have won three straight F1 titles. Force India’s Paul di Resta finished a career-best fourth ahead of Mercedes’ Nico Rosberg. Kimi Raikkonen of Lotus was sixth and maintained third place in the championship standings despite not having won a race. Lotus teammate Romain Grosjean was seventh. Felipe Massa of Ferrari finished eighth after dropping down to last following a first-lap puncture, and he finished ahead of Toro Rosso’s Daniel Ricciardo, in only his second points finish of the season. Fellow Australian Mark Webber of Red Bull crossed the line in 10th, but was given a 20-second penalty for overtaking off the limits of the track, dropping him down to 11th and moving Sauber’s Sergio Perez into the last points position. Schumacher was also given a penalty after crashing heavily into the back of Toro Rosso’s Jean-Eric Vergne. He was handed a 10 grid-place penalty for the next race, as he admitted the error and it was his second similar offense this season. Williams driver Pastor Maldonado started in a surprise second place and was running in third position halfway through the race but was forced to retire with a hydraulic failure. Jenson Button travels to Italy positive that McLaren can finally claim another Constructors’ Championship title this year. The Woking-based team is yet to pick up the honour since Mika Häkkinen and David Coulthard were its drivers in 1998. By winning in Belgium last Sunday, McLaren has become the first team to win both four races and two consecutively in what is an ultra-competitive 2012 Formula 1 campaign. Martin Whitmarsh is now also more optimistic about constructors’ chances. “Our victories in Hungary and Spa hardly feel like back-to-back wins, because they were achieved so far apart, but they give us enormous encouragement because they demonstrate that we can win on circuits of distinctly different character,” the Team Principal begins. “While I still think that making predictions from race to race is largely futile, it’s satisfying to see there’s some shape to our performances. We’ve qualified a car on the front row of the grid for seven of this year’s 12 races – and that’s hugely motivational for our designers and engineers because it shows that we’re able to develop and refine the car successfully from track to track. There’s no reason why that shouldn’t continue. Sauber is a realistic contender for victory in today’s Belgian Grand Prix, according to team CEO Monisha Kaltenborn. Kamui Kobayashi lines up second on the grid, the Sauber team’s first front row start as a fully-independent team since Jean Alesi at the 1999 French Grand Prix, with Sergio Perez fourth. The Sauber-Ferrari C30 has shown consistently strong race pace over the season, but its results have often been compromised by disappointing qualifying performances, something that will not hold the Swiss team back at Spa.